Just 20 kilometers south of Kuching, there is a natural habitat which acts as a home to Orangutans. The Semenggoh Wildlife Centre of Semenggoh Nature Reserve is by far the biggest Orangutan Rehabilitation Centre in Sarawak. Back in 1975, it was established as a sanctuary for Orangutans who are injured, orphaned or being kept captive as illegal pets. Currently, the centre serves as a habitat for the Orangutans and also a place for visitors to learn about the endangered rare species. This wildlife centre has a thriving population of healthy adolescent and young adult semi-wild Orangutans. They spend most of their time roaming the forest but are trained to get back to the centre during feeding times where they will be able to get a free meal from the caretakers. Though they have been trained to get back to the centre during feeding time, they may not appear to get a free meal during the forest fruiting season. Besides orangutans, Semenggoh Nature Reserve is also a habitat for rare flora and fauna including the giant squirrel, pigmy squirrel, gibbons and splendid variety of birds. The howling of gibbons, the chirping of birds and the chattering of Orangutans make the nature reserve an ideal place for nature lovers. Sarawak Government established Sarawak Forestry to position Sarawak at the forefront of sustainable forest management and conservation. Since 2003, Semenggoh Nature Reserve had been administrated and cared for by SARAWAK FORESTRY. In the early days, Semenggoh was the site for shifting cultivation by the Dayak and the Javanese planting of rubber (Hevea brassiliansis), gambier, tea and herbs. In 1920, this shifting cultivation area was gazetted as Forest Reserve, the first ever Forest Reserve in Sarawak and used as a botanical research plot. The name Semenggoh Forest Reserve was derived from the Semenggoh River which runs through the Reserve to Sungai Kuap. Being the oldest nature reserve, Semenggoh plays important roles and functions in flora and fauna conservation. After the establishment of the research plot in the Reserve, a Forest Training School was built to train the Forestry’s staff on botany. At one point in time, the Brooke’s Pool in the Reserve played a major role in supplying gravity feed water to Leper Camp which is now renamed as Rajah Charles Brooke Memorial Hospital. After having existed for almost 80 years, Semenggoh Forest Reserve was declared as a Semenggoh Nature Reserve on 20th February 2000 vide Sarawak Gazette Notification No. 1497 Vol. LV dated 12 April, 2000 with a total area of 653 ha. The change of status from Forest Reserve to Nature Reserve was to ensure firm tenure-ship of the area. Semenggoh Nature Reserve is declared as a TPA to protect the habitat of the semi-wild orangutans in Semenggoh. Today, the Reserve is home to the SARAWAK FORESTRY’s Botanical Research Centre (BRC), Seed Bank & Nursery, Semenggoh Wildlife Centre (SWC) and Sarawak Biodiversity Centre (SBC). Located 20 km to the South of Kuching along the Borneo Heights Road, is an easily accessible top destination for nature lovers that has lots to offer. Care of wild animals which have either been injured in the forests, orphaned of kept illegally as pets. After rehabilitation, the animals would eventually release back into the wild so that they can be free. 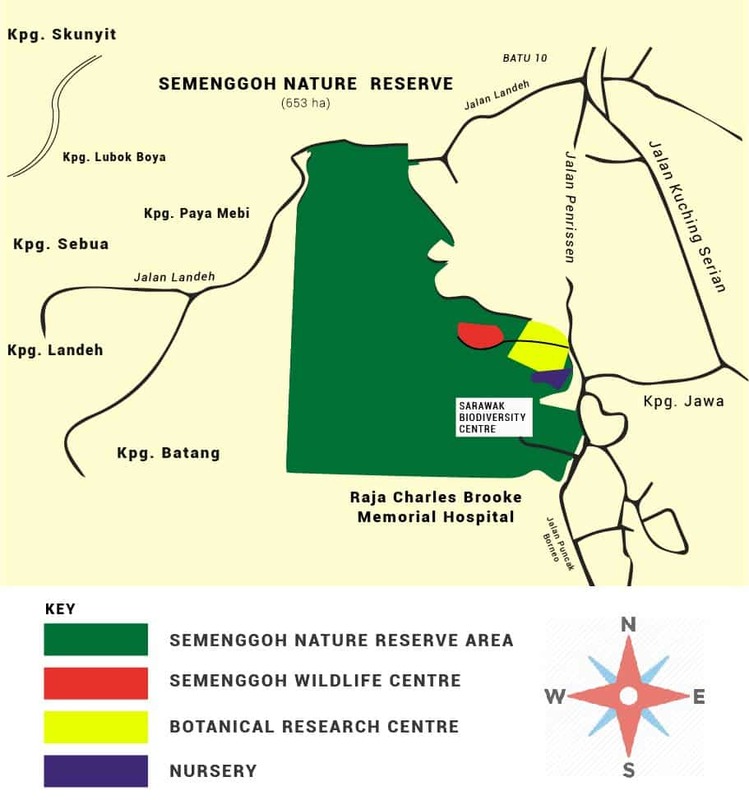 In the year 2000, the Management changed the name Semenggoh Wildlife Rehabilitation Centre to Semenggoh Wildlife Centre. 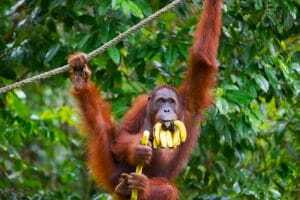 All the animals have either been released back to the wild or sent to Matang Wildlife Centre. Currently, SWC plays a complementary role for quarantine and transit of wildlife before being sent to Matang. SWC is active in nature and wildlife awareness progams for schools and the public. 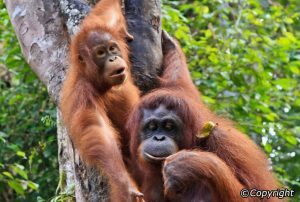 Today, orangutans have long been the most admired species at Semenggoh. They are the main attraction for tourists visiting Sarawak. Semenggoh Nature Reserve consists mainly of primary lowland mixed dipterocarp forest with small patches of old secondary forests and kerangas forest. The undisturbed primary forest is one of the biodiversity hotspots in Sarawak. Many rare and endangered species can be found here e.g. a palm species, Areca ahmadeii, which is endemic to Semenggoh Nature Reserve. In this uniquely mixed vegetation with over 200 species recorded; in certain areas dipterocarp species dominant, whereas, in the heath forest mainly non-dipterocarp. Dominant trees of the genus Tristania, of the family Myrtaceae; rattan of different species also abundant. Pitcher plants found are mainly in the Reserve is Nepenthes ampularia. Semenggoh Nature Reserve houses various rare flora and fauna. It is known to be inhabited by a large variety of birds, of which mostly are migrants. Birds that are commonly seen here include the bulbuls, babblers, barbets, kingfisher, shamas, drongos, pigeons, woodpeckers and tailorbirds. Semenggoh Forest. Common animals that can be found here squirrels, snakes, wild boars, monitor lizards and etc. Since the establishment of Semenggoh Wildlife Rehabilitation Centre in 1972, a total of 44 birds species (hornbills, eagles, pheasants, owl, stork, egret, woodpecker, parrot, fowl, swan, bobbies, pigeon and starlings) and 34 species of animals (orangutans, gibbons, tarsiers, slow loris, macaque, monkeys, langurs, bears, wild cats, civets, squirrel, flying fox, porcupine, pangolin, crocodile, soft shell turtles, tortoise and phyton) have been cared for here. Thanks to the rehabilitation effort of confiscated and surrendered animals, there are also other animals which are not natural inhabitants of the Reserve that can be found here. There are a few groups of gibbons and long-tail macaques residing in Reserve along with Crocodiles.